FAQs - Is the water in my tap groundwater? Groundwater provides about one-third of public water supplies in England and Wales, 6% in Northern Ireland and 3% in Scotland. These regional differences reflect the distribution of the major aquifers (permeable rocks that store groundwater and allow it to flow readily into a well or borehole) and the more favourable conditions for the development of surface water resources in Northern Ireland and Scotland. This map shows how the proportion of public water supply derived from groundwater varies across the UK and gives you an indication of the likelihood that the water in your tap comes from a local aquifer. 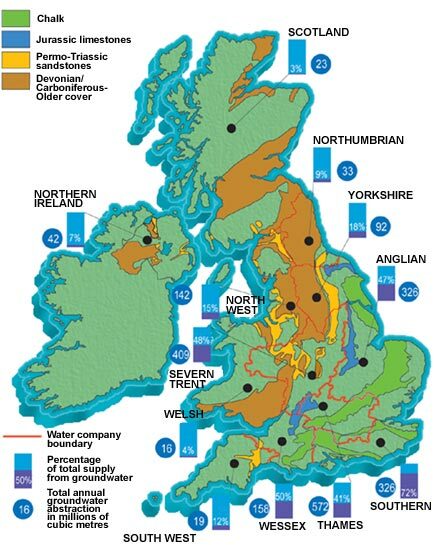 The majority of groundwater is abstracted in central, eastern and south-eastern England due to the combination of high populations and relatively good groundwater resources.